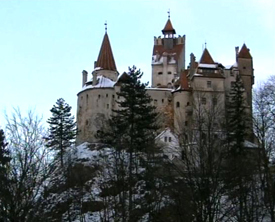 One of the places he stayed was the imposing Bran Castle (pictured right) to which today thousands of tourists come in the belief that it was the home of Count Dracula as described in Bram Stoker's novel. 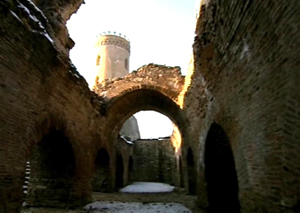 In later years this Castle was extensively modernised by the Romanian royalty particularly at the start of the 20th century but the remains of the original castle which would have been there when Vlad visited in the 1450s are still in existence. This would have been the perfect place from which Vlad could launch his bid for power. This he did when in 1456 AD, Vlad seized the Princedom of the southern province of Wallachia taking Tirgoviste as his capital city - a move which followed tradition. In these early days, it really was a case of kill or be killed and Vlad very much expected to be assassinated himself if he did not act quickly. The same boyars or landowners who had assassinated his father had to be dealt with or Vlad would never be safe. With self protection in mind, Vlad set about building and fortifying his palace complex at Tirgoviste. 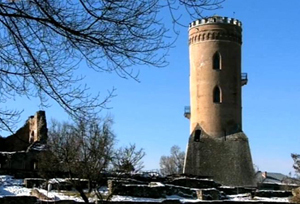 This was a project which had been started by his grandfather but Vlad went to extraordinary lengths in its development building a watchtower which would give him a clear and panoramic view of his surrounding area and encasing the whole complex in walls which would have been at least 5 feet thick. Underneath the Palace, he also developed a vast complex of cellars which many believe housed his own private torture chambers (pictured below - click on photo to see interior dungeon). When the palace complex was completed, it was a highly defensible series of barriers which would have provided many hurdles which are potential attacker would have had to overcome. With his sanctuary of Tirgoviste complete, Vlad set about, with his legendary cunning, the task of getting rid of the boyars for this would be the only way he could gain and retain absolute power. In 1457 AD on Easter Sunday, Vlad invited the boyars to a feast in his great Hall and during the feast he asked them how many lords they had had and none of them could remember because of course there have been so many due to the fact that the boyars themselves had got rid of them. This response condemned the boyars to death and it is said that Vlad had 500 of them impaled on stakes so that they would die a horrible death. However, Vlad Dracula did not kill all of the men right away. For some, he had a more productive but slower end in mind! This would be the building of the Castle Poenari.